Last year after I expanded my garden I needed to fence it in to keep out the bunnies, neighborhood dogs, and stray cats. 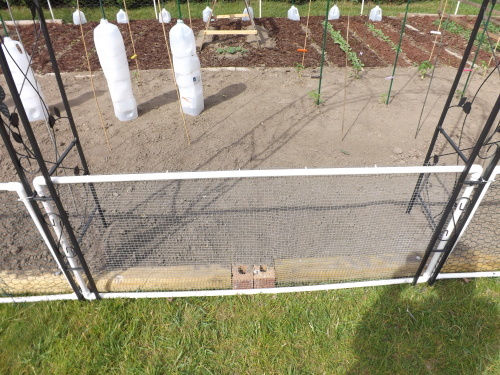 I found some chicken wire at a garage sale for $5.00 and wrapped it around the garden using stakes at the corners and mid-points to hold it up. At the beginning of the summer the fence stood up pretty good and kept out unwanted critters. By mid-summer and especially late-summer, however, the fence began to sage and lean in towards the plants. Eventually it got so bad that I had to put plant stakes every couple of feet in order to keep it from falling on my plants. This year, when I decided to expand the garden even more, I knew I would have to find some way to “fence” in my garden in such a way that I wouldn’t have to worry about it falling all over my plants. 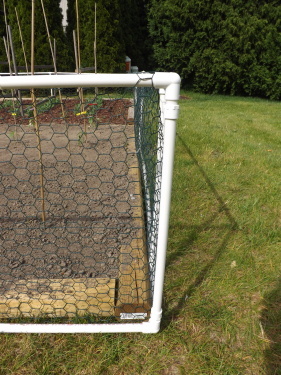 My first thought was to use 1″ x 2″ x 8′ pieces of wood to make a frame to staple the chicken wire to. The sections would be 8 feet long and 2 feet high. I bought the materials to make one section to see how I liked it. After completing the section and attaching the chicken wire to it, I decided that it was really more cumbersome than I wanted it to be. It would be hard to use one continuous piece of chicken wire for the entire fence when each section would have to be stapled and installed independently of the others. So, back to the drawing board I went. Thinking back to when I used to home school my kids, I remembered that I used to use PVC pipe and connectors for any number of things. From chart stands to building blocks to geometric shape models, I always found a use for it. PVC pipe would be weather-proof, sturdy, and flexible when it came to framing the entire garden. Cutting it would be no problem and with the wide variety of connector options, there was nothing standing in my way. For my 16′ x 32′ garden it took 25 – 10 foot sections of 1/2″ PVC pipe, 32 t-connectors, 8 elbows, 8 – 3-way side elbow’s, and 8 male adapter sockets. 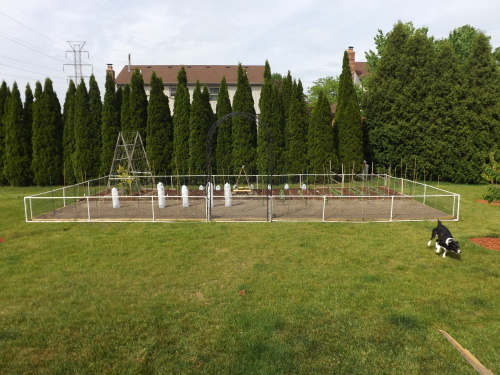 For right around $50.00 I was able to fence in the entire garden, make it look neat and clean, and eliminate the threat of any animals trespassing into the garden or floppy fence sections falling on top of my plants. First I cut each 10′ section of pipe in half. This made each fence section easy to manage and helped ensure that the pipe wouldn’t sag. 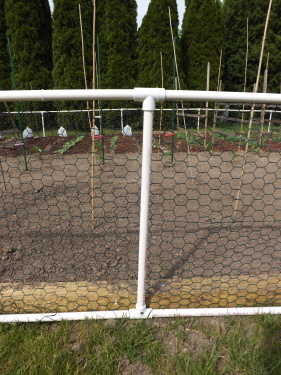 To connect the sections together I used t-connectors and a smaller section of PVC pipe cut to fit the height of the chicken wire perfectly and then screwed the bottom t-connector into the landscape timbers framing the garden. 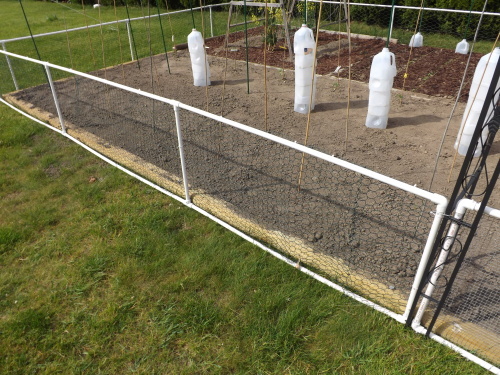 The chicken wire was run along the inside of the garden for aesthetic purposes and secured with zip ties. When I reached a corner I used the 3-way side elbows with a male adapter and more PVC pipe. Again the bottom 3-way elbow was screwed into the landscape timbers for stability. I also bought a garden arch that I wanted to put in the garden to mark the “entrance.” This meant I needed to make a gate. Not wanting to get too complicated, I used elbows to make a frame that fit perfectly between the sides of the arch and pulled the arch just far enough away from the landscape timbers so I could wedge the gate there when not working in the garden. To remove I just lift slightly and remove it. I used the chicken wire I bought at the garage sale last year for the entire garden except the gate. I was short just that much. Fortunately, while Hubby and I were driving around one evening I happened to see a small section of wire fencing in someone’s garbage. I threw it in the trunk and viola! it fit perfectly. I love my new fence. I think it makes the garden look like a real garden and not just a really big sandbox. Even my neighbors have stopped by to tell me how nice it looks. One of them even went so far as to suggest I send it in to Home & Garden magazine. I’m not going to take it that far, but boy am I proud of my work. A little ingenuity, a few sections of PVC pipe, and some time well spent equals a fence that should last a long, long time, and for this I am — Simply Grateful. Categories: Garden Gadgets, Garden Prep | Tags: Fencing, Garden Fence, Gardening, PVC Pipe Fence | Permalink.